Custom 62-Inch Arc Fiberglass Golf Umbrella is made from multiple materials. 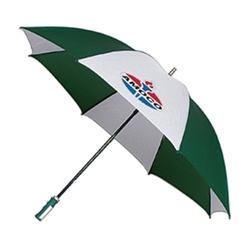 Personalized Golf Umbrella features sturdy construction. Custom 62-Inch Arc Fiberglass Golf Umbrella is available in 7 colors: Black/White, Royal Blue/White, Navy Blue/White, Forest Green/White, Red/White, Grey/White, and Solid Black. Imprinted area: 9 1/2" X 7"